Taking time to make plans for making plans is not that easy when you’re lazy – which is quite problematic since I actually have to plan a lot of things. So from the end of February I’m traveling around in Asia, which I also mentioned in a previous post. My flight tickets are bought; I’ll spend around 3 weeks in South Asia and 5 months in Japan where I’ll be an exchange student at Kobe University. My husband and I have pretty much found the apartment we need in Kobe, but our 3 weeks of travel in South Asia are far from planned. So far we do have flight tickets to and from Bangkok and we’ve also reserved a hotel for the first night in Bangkok. Then the plan was to rent a weekly apartment in that lively city, go on a day trip to Pattaya and spend a night at a hotel. Then we hope to go to Cambodia, first spending around two nights in Siem Reap (Angkor Wat) and then get on a bus going to the capital Phnom Penh where we’ll aso spend two nights. Then our travel continues to Ho Chi Minh City in South Vietnam, followed by stops in Du Nang and Hanoi. Like Cambodia we’ll probably spend two or three nights in each of the 3 cities and we’re also aware of the huge amount of travel time, which is also one of the reasons I decided to add Du Nang to the trip, so we didn’t have to travel the very long journey from Ho Chi Minh City to Hanoi in one stretch, which would either a 2-day train journey or a more expensive flight ticket. So far we have not really planned out our means of transport in Vietnam and how to get to both Du Nang and Hanoi as things are now, trains seems like the best option. We also need to sort out our dates of travel to both reserve transport and hotel as well in both Cambodia and Vietnam. We also have to look into flight tickets from Hanoi and back to Bangkok. My husband wanted to go back to Bangkok through Laos, but I, as a Danish citizen need a visa to get into Laos. We need a visa in Cambodia as well, but that can easily be bought at the border for 20USD. Both my husband and I (as Danish and Japanese citizen) are allowed to stay in Vietnam for max. 15 days without a visa. So in the end we plan to take a plane back to Bangkok, spend a night on a hotel and then the next day go to the airport and get on a flight to Osaka and there start my exchange student life in Kobe city. I hope to update this blog a lot while I travel, but I’ll probably also have days where I’m too tired, but I’ll do my best. Traveling was actually one of the purposes I made this blog for. I’ve also created a twitter account so I can update on the “small and short stuff” so if you have twitter please follow me. The link is both in the sidebar and in the end of this blog entry. Yesterday I decided to buy my flight tickets for my semester in Japan. This time around I had to put a little more planning into buying flight tickets than I normally do. First of all, I had to consider when my semester ends at the Japanese university and when my exams might start at my Danish university. My husband and I have also been talking about staying in Thailand for a few weeks before I enter Japan, which resulted in the fact that we also had to take his work schedule into consideration. So after having fully discussed with my husband on the phone, I went ahead and started searching for the cheapest tickets. My husband wanted us both to arrive in Bangkok at the 26th of February (me from Denmark and him from Japan), but flights with departure on the 25th from Denmark cost around 30% more, so I chose to departure on the 24th and then arrive in Bangkok at the 25th. Since the cheapest tickets were Air China I’ll transfer in Beijing. I e-mailed my husband my ticket information and he decided to then also book his flight with Air China, also with a transfer in Beijing. Then we’ll both board the same flight from Beijing to Bangkok. He also found the same tickets for going from Bangkok to Osaka, as mine. I’ll enter Japan on the 16th of March and I’ll return back to Denmark on August 13th. It felt a little weird ordering tickets with a return date so far away, since the longest I’ve been traveling yet is two and a half months. This time around it’ll be for six months. [February 24th – 25th ]Copenhagen – Beijing – Bangkok. [August 13th] Osaka – Beijing – Stockholm – Copenhagen. 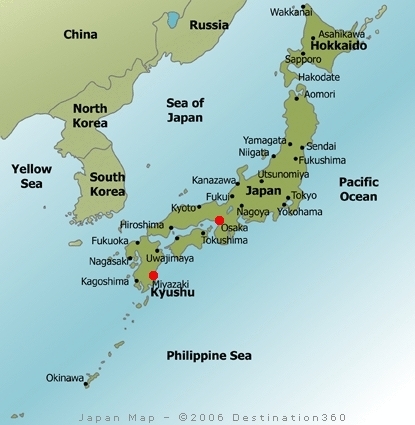 I’m very much looking forward to experiencing South Asia, since I’ve so far only been able to visit Japan and China. My husband and I have also talked about visiting Vietnam and maybe Cambodia while we’re in Thailand – since these are also countries I’ve wanted to see for quite some time. I’m very exited about this opportunity to see interesting and unique countries and I’ve always wanted to explore more of Asia and experience so many new things. I’ll also be my first time flying with Air China and transferring in Beijing. (When I went to China I went to Shanghai and Nanjing). I hope everyone had a nice weekend. 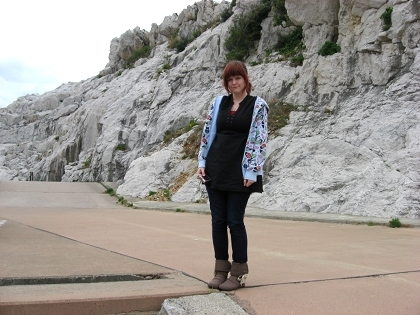 So I haven’t updated this blog in ages. Mostly due the fact that I’m not in Japan in the moment, I find it therefore hard to come up with new ideas for a new post. The other reason is that I’ve been too busy. I spent October month and some of November with my husband, who has now gone back to Japan and to his work. We’ll see each other again in five weeks. In the mean time, the end of the semester is coming closer, which means lots of homework, boring assignments and exam preparation. Another thing that is also adding to the stress is filling out application papers for our prospective Japanese university. I’ve been accepted into Japan’s Kobe University for 6 months, starting this upcoming spring. Which I’m really happy about, since studying in Kansai was my first priority. Now I just have to fill out all their required papers. 9. Certificate of enrollment of the Applicant for Student Exchange Support Program. I also had to apply for a new passport, even though I had only used it for 10 months instead of 10 years, since I got married to my husband in the meantime and then got my new Japanese surname. Unfortunately I’m not too far into the process. In the application form, I’m required to write about my study plan at Kobe University and then also write a self-introduction in Japanese (400-800 characters). It’s not that I can’t write a self-introduction in Japanese, it’s more that I have no idea of what to actually write. The same goes for the study plan. I have not filled out the Application for Certificate of Eligibility, yet either. That is because I have not decided, yet, whether I’ll use my spouse visa or the offered student visa. There are problems with both. Since Kobe decides when documents will be sent out, I might not be able to receive my Certificate of Eligibility (which makes it possible for me to receive my visa from the Japanese embassy) before in February, which can result in my not receiving my visa before March. Since my semester in Japan doesn’t start before April, I have time enough, but due to my husbands work schedule, I wish to go to Japan already in the middle of February. The problem with the Spouse visa is that I will then not be seen as an international student and I then will not be able to live in the international student dormitories. I’m requested to apply for the same dormitories as the Japanese students, without any priorities. I’ll talk this over with my husband once again, before making the final decision. My husband have been kind enough to fill out the Financial Statement – which means he becomes obligated to support me financially during the whole semester. And then there’s the health certificate, I have booked a meeting with my doctor this week, so that’s progressing and then I need the copy of my passport and the small passport sized photos. So many things to do, so little time. I really need to figure out what to write in the self-introduction. Back in January I wrote about a book called “Osaka Rules”, well later on during that trip I decided to buy the rest of the books in the series. When I went back to Japan in March, a new one had been released “Hokkaido Rules”. So now I have the following (from top left): Hokkaido Rules, Tokyo Rules, Osaka Rules, Nagoya rules and Hakata Rules. There is also a “Okinawa Rules”, but I haven’t bought that, yet. 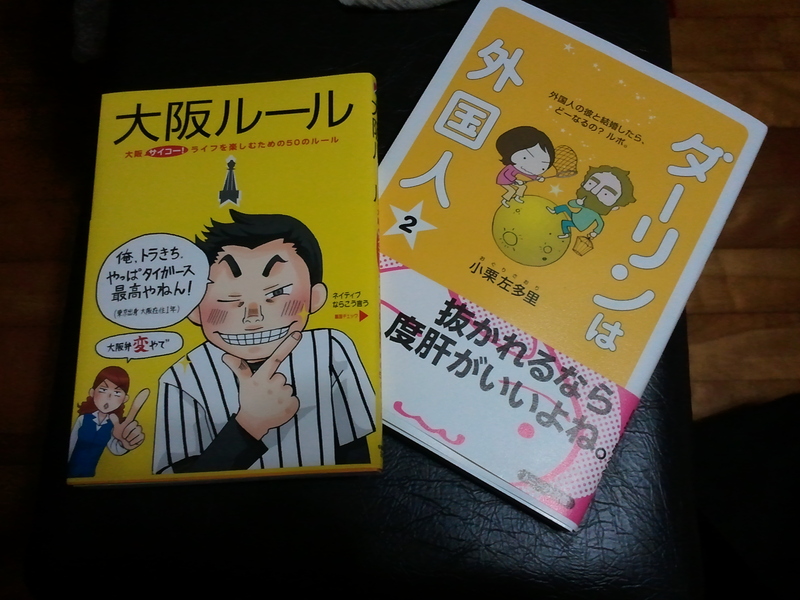 These are very fun and interesting book about social “rules” in different areas in Japan. Even my husband had a lot of fun reading them. The books ranges from everything when it comes to “shopping”, “food”, “words”, “living” and etc. in the certain area of interest. Like Tokyo people loves to shop expensive brands, in Osaka you should not use the word “jyan” and people in Hokkaido are well prepared for the cold winters. The rules are well written, in a more easy Japanese, in well-divided categories and some rules are even followed by a page of humorous manga to explain further. I wonder if more books will come, like Hiroshima or from an area in Tohoku. 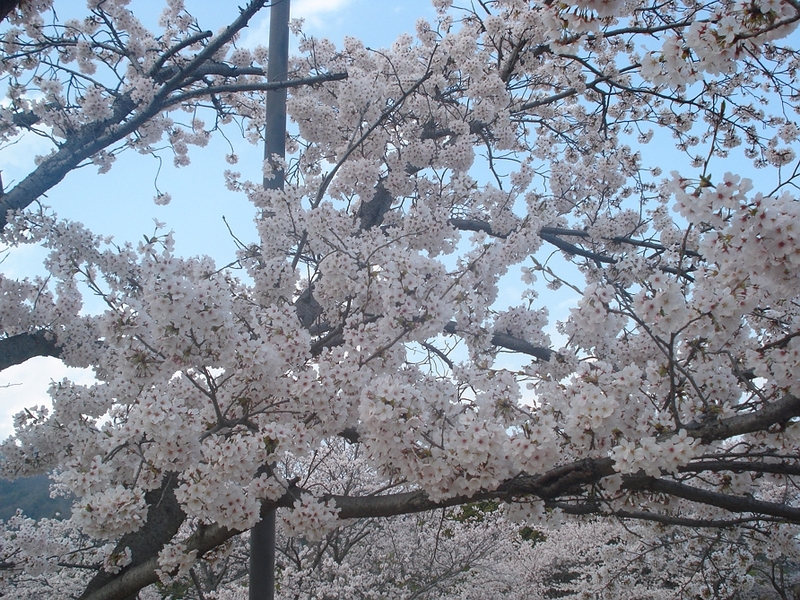 The spring is without a doubt my favorite season here in Japan, it’s not too warm and it’s not too cold and besides there’s the popular cherry blossoms, Sakura. 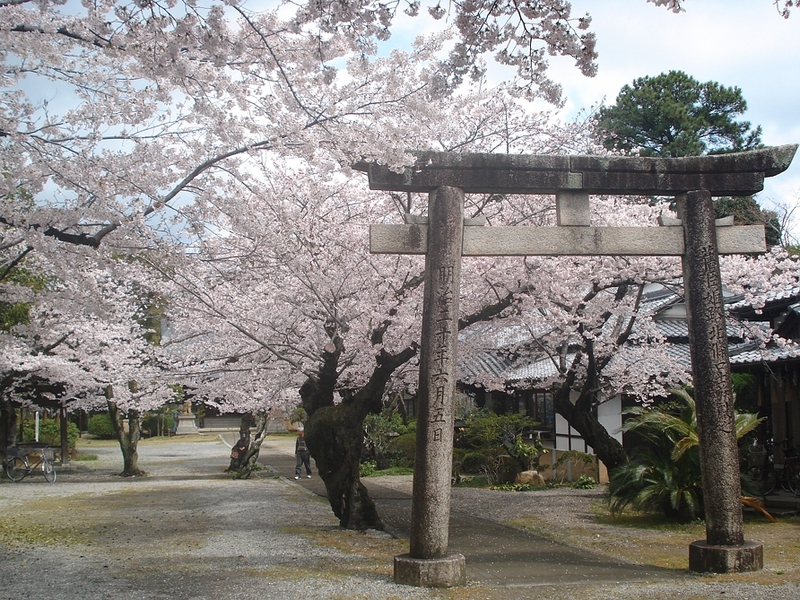 I definitely recommend going to Japan in late March or early April to get the best scenic views of the country. 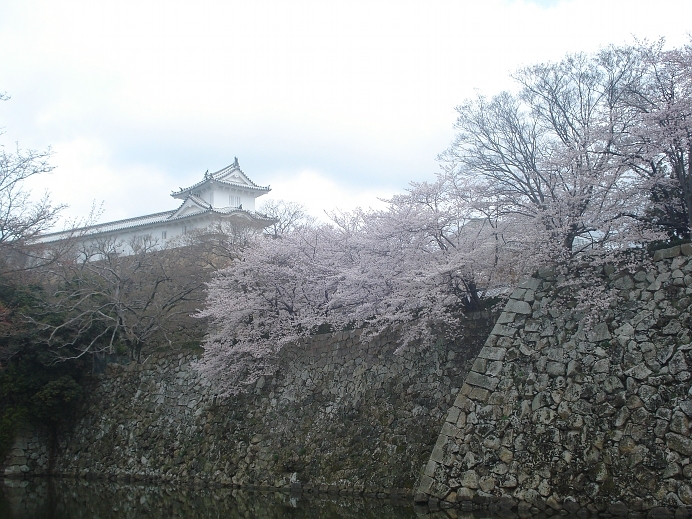 From Wednesday to Saturday my husband and I went on a road trip to Osaka. 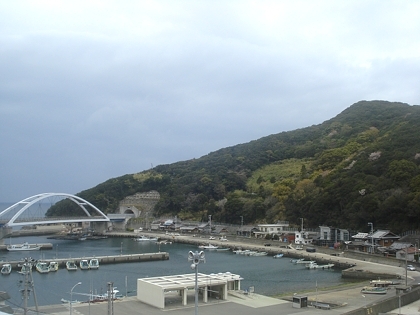 Which is a around 12 hour trip from Miyazaki in South Japan. I’ve already been to Osaka twice, so the main reason for going was to fix some marriage paper work at the “Ministry of Foreign Affairs”. 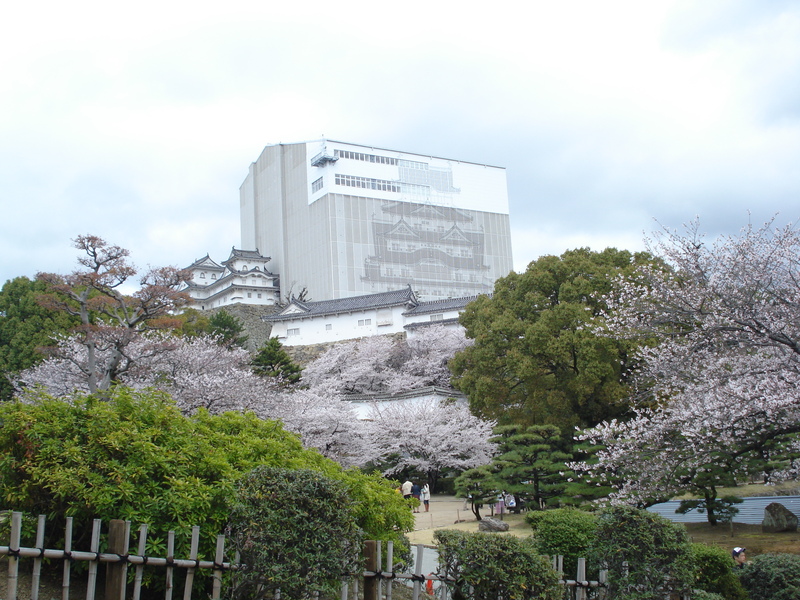 On the way back to Kyushu we decided to drive by Himeji, since I’ve never seen the Himeji castle and thought it would be great to see now where the Cherry trees are blossoming beautifully. Unfortunately Himeji is under construction… a big let down. 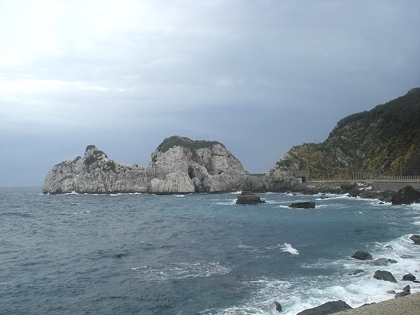 Today we took a drive around in the Wakayama prefecture, since it’s one of the few places in the Kansai area I hadn’t seen before. We saw a lot of nature, small villages, mountains… and a lot of rocks. In the evening we had dinner with a friend of mine I met the first time I was in Osaka. Back then we spoke mostly English together due to my limited Japanese skills, but this time around all communication was in Japanese. Around 1 am on April 6th my husband and I got in the car and started a very long drive from Miyazaki to Osaka. I fell asleep pretty fast while my husband was busy driving. Around 6 am we drove into a rest stop where we both slept in the car for about an hour. The day before we had bought several snacks, bread and beverage to get us through the trip. Around 12 pm we arrived in Osaka city. As the first thing we headed to the “Ministry of Foreign Affairs” to hand in some documents, which would take a for the ministry to return. The Osaka ministry building was very old inside and certainly needed a hand several places with cracks in the walls, floor and even some windows. We headed to the floor for foreign affairs where we were assigned a number and told to wait outside in the hall way. Then when it became our turn we were let into a small room with two desks. We handed in our papers and received a number. After that we headed to our hotel. 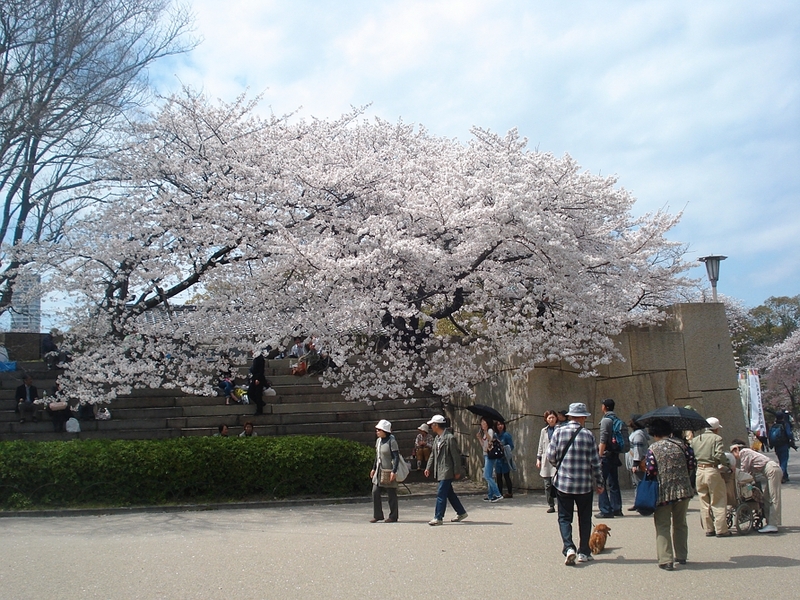 The next day we went to pick up our papers at the ministry, but since we were a bit too early we went to Osaka castle which was located just across the ministry building. 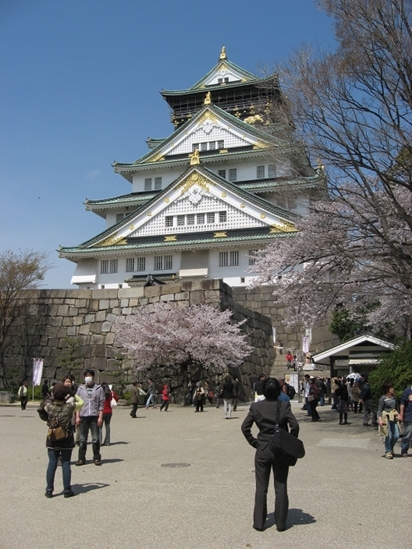 I, myself had seen Osaka castle twice, but since my husband hadn’t seen it before I wanted to show him it. After that, we picked up our papers and then we headed towards my favorite place in Osaka – Namba. Of course “shopping” was the main purpose. 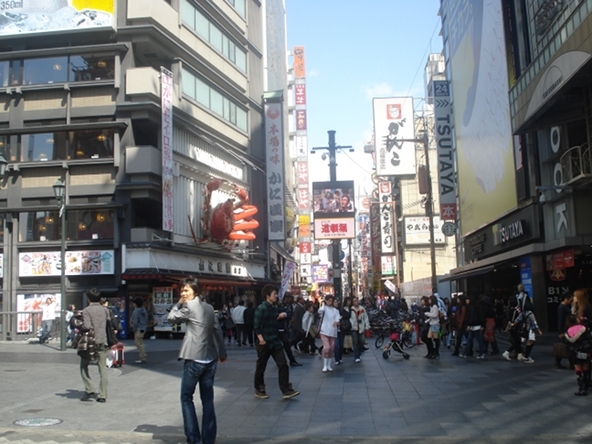 The famous Shinsaibashi shopping street, is a dream place for shoppers. 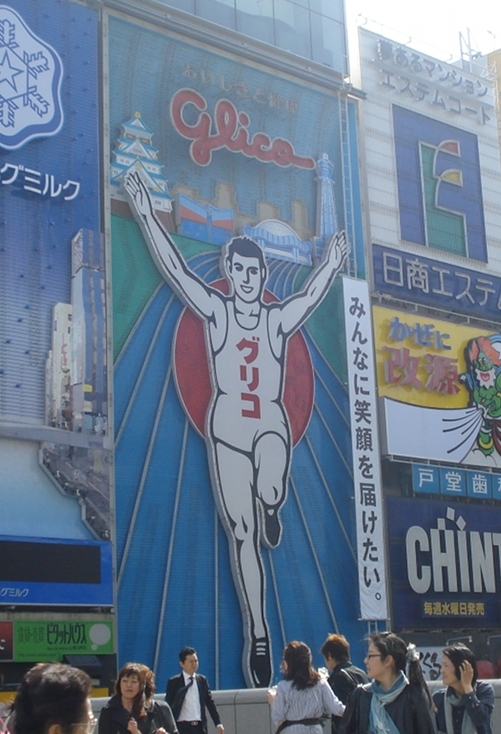 The Glico man with a message after the earthquake. Then we also had dinner in Namba and went back to our hotel to sleep. Understanding Osaka and life with foreigners. Recently I’ve become rather interested in buying Japanese books, not sure why, since my previous obsession was buying Japanese CDs. Maybe because I’m starting to be able to read and understand at the more “required” level. Anyway… while waiting in Haneda airport I bought these two books. “Osaka Rules” and “Daarin wa Gaikokujin, vol. 2” (Darling is a foreigner). Since I already had read the first book of the popular “Darling is a foreigner” series, I thought I could might as well get volume 2. These manga books, shows the funny differences there is between Japanese people and foreigners. The author and writer of this manga, Oguri Saori, portrays these differences by sharing situations from her own life, where she is married to a foreigner. I was recommended this book/manga when I did homestay in Nagoya last year. Since the wife of the family thought it could be “useful and fun” for me to read, being a foreigner in a relationship with a Japanese myself. For me these books are seen from the opposite direction, I guess, but they are interesting. The “Osaka rules” book was “a spur of the moment” purchase. I just saw it on the shelf, and being the “Osaka-fan” that I am, I thought to myself that this must be a “must-read” book for me. I love Osaka and it’s without a doubt my favourite place, not only in Japan, but in the whole world. I can’t explain why, but Osaka has something I can’t help but love. This book has gathered the so-called “rules of Osaka” and divided them into categories, such as: Food, language, shopping and etc. The book has a really nice humor as it explains the interesting “quirks” of Osaka and a lot of the “rules” are followed by a one-page manga to show what exactly the rule is about. Besides Osaka, there’s also: Tokyo rules, Nagoya rules and Hakata rules. As of now. I thought about buying some of the others. Since these books are fun and interesting reading material for people who has a interest in Japan – and who is able to read Japanese, of course.